It has been a weekend for fine sporting gestures. On Saturday, New Zealand's Sonny Bill Williams handed his Rugby World Cup winner's medal to a 15-year-old boy who had been tackled to the Twickenham turf by a security guard. On Sunday, Bournemouth told a 12-year-old fan, who was "distraught" after he missed a shirt thrown into the crowd by a Cherries player, that he would get a replacement shirt and meet his idols. 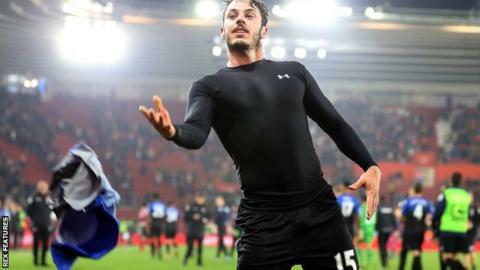 Torie Freestone posted a message on social media after her son, Lewis, did not catch defender Adam Smith's shirt following Bournemouth's 2-0 defeat at Southampton. Having heard about what happened, 24-year-old Smith wrote on Twitter: "How can I find the mum of the kid? I'll give him another shirt." After people responded and passed on contact details, Bournemouth broadcast and media executive Kelly Somers later tweeted: "The power of social media - thanks to Bournemouth fans, the boy... is getting a new shirt and meeting the team." Lewis's father, Rob Fellows, replied to Smith and wrote: "Thanks Adam for this as you have made my son very happy as he was distraught after the incident." Initially it was thought that a fellow supporter had snatched the shirt away from Lewis, but Mr Fellows later clarified that was not the case. Bournemouth head of media and communications Max Fitzgerald said: "Kelly contacted Lewis's mother after the game and she was delighted to accept Adam Smith's gesture. "Adam was understandably shocked when he discovered what had happened to Lewis on social media and he was more than happy to try and rectify the situation."